If you recall I wrote how the USA is a major producer of oil. It turns out we are producing so much we are actually at record high storage levels as a result. Here is the US Ending Stock of Crude Oil from the EIA. 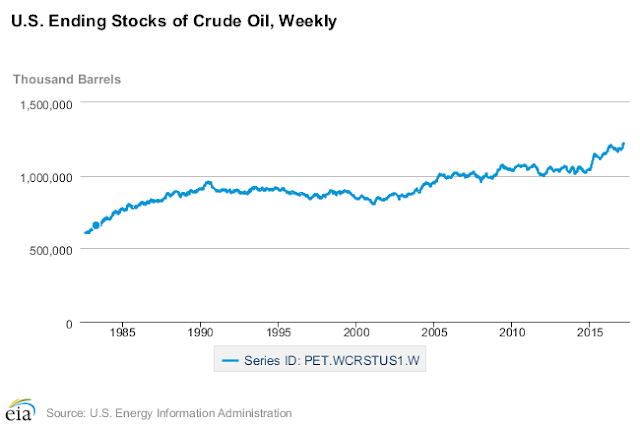 It's a weekly number that shows how many barrels of oil are currently in inventory for the USA. You can see that the number has been spiking to new highs quite quickly since 2015 which coincides with the drop in crude prices. Currently there are 1.2 billion barrels of oil in inventory.